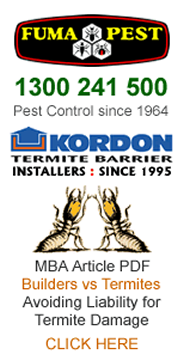 FUMAPEST Blue Mountains Termite & Pest Control 1300 241 500 are licensed installers of the KORDON Termite Barrier in buildings during construction. KORDON Termite Barrier for Builders is manufactured by Bayer Australia • complies with AS 3660 and is CodeMark Accredited to meet Blue Mountains Council requirements. Find NSW Govt DFT Licensed Home Builders in Blue Mountains Council region. Blue Mountains Council TPO Tree Preservation Orders • Blue Mountains Council Application Forms • Tree Removal • Tree Lopping • Tree Pruning • Stump Grinding & Removal. Find Vets • Veterinary Hospitals • Surgeons • Clinics in Blue Mountains Council region. FUMAPEST Blue Mountains Pest Control 1300 241 500 for safe effective pest control of cockroaches • ants • bed bugs • fleas • rats • mice • spiders • bees • wasps • silverfish • bird proofing • termite inspection reports • termite control • termite barriers • termite baiting.